We have no serious posts! Only cake! Originally I’d planned to post a little about writing Soul Hunt, specifically the darker parts of it, not just in terms of content but mood. Evie’s passage through this part of her life is not an easy one, and there were some elements that ended up being more sensitive to me than I expected. It was meant to be a very serious post. There was a party! And cake! And I read from Soul Hunt! And there was cake! And people liked it! And did I mention the cake? Because it was there! You are all fantastic. Thanks to everyone who braved the slush and wind to come out to Pandemonium, everyone who’s commented and written and said hello, and all my wonderful readers. Any time I start to fret and doubt, all I have to do is remember how awesome you are. 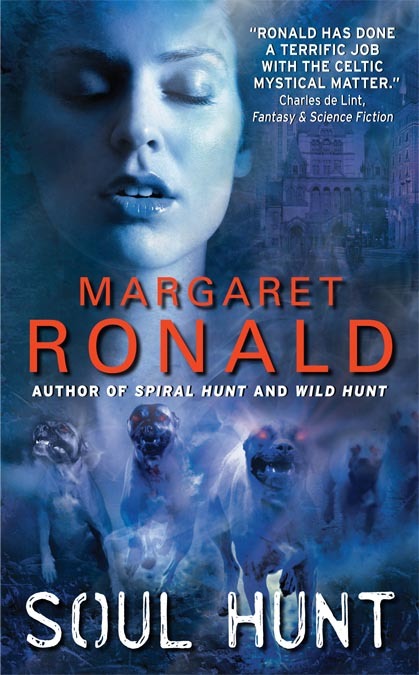 I’ve been interviewed by Melissa at My World in Words and Pages concerning Soul Hunt, research, short stories, and more. If you’re curious about what’s to come in the next book — oh God, that’s barely more than a week from today — then go on over and take a look. Thanks again to Melissa for the interview! You know, if I end a post “more about that later today,” I should really remember to take care of that before shutting off the Internet and settling in for an evening of pizza and Middleman episodes with the resident organist. As it is, my news isn’t all that big, unless you’re in the Boston area. 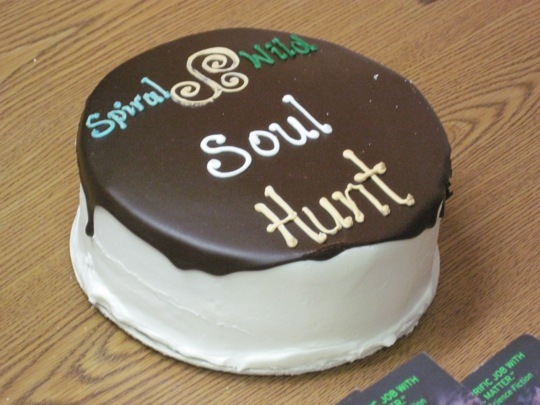 I’d just like to give the Soul Hunt release party its own post. 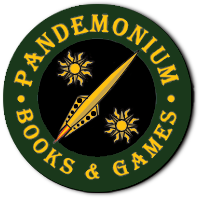 Pandemonium Books and Games will be hosting the reading and signing on Tuesday, December 28, at 7:00 PM. Come by and heckle listen to an excerpt of Soul Hunt, then wander around Pandemonium and get yourself some new books for the new year! Good God. How did it turn into December? (And why are there three empty cartons of eggnog in the kitchen?) The days draw in, the nights get colder, the frost heaves heave, and we all start looking forward to that one special day…that’s right, the release date for Soul Hunt! The third Evie novel comes out on December 28, just in time to pick up copies for people who haven’t gotten gifts yet — or for yourself, as a “made it through the year!” gift. Follow Evie as she deals with the consequences of Wild Hunt, the changes, the debts…and the bargains she makes to survive those consequences. If you’re not in the Boston area, and you just can’t wait to get your hands on a copy…well, I might be able to help you out. You see, I’ve got a couple of e-ARCs here, and I’m happy to send them to, say, the first three commenters who request one. These are for e-books, though, so if reading on a screen is not your thing, you may have to wait until I have the bound copies in hand. The other thing I’d request from anyone who gets an e-ARC is that you post about it — Facebook, Livejournal, your own blog, whatever you like. Review it if you like, roast it if you like, but just a mention would be very nice (even something along the lines of “this is a book”).